Lionel Loueke, who last month thrilled Seattle fans in his appearance here with Herbie Hancock’s band, tells an amusing anecdote about how making a living as a musician has worked out better than his parents feared. When he was growing up in Benin, in West Africa, his parents hoped he would go into law or some other profitable or secure professional because, after all, “music isn’t a job because pretty much everybody plays something in Africa,” he told the Financial Times last year. 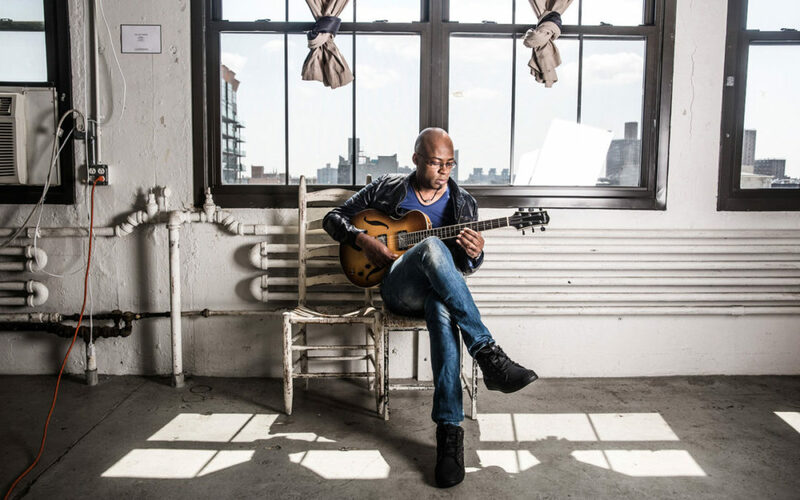 But the guitarist and vocalist, who has soaked in a vast array of styles from West Africa and the West, has come to command broad acclaim in many walks of jazz and popular music. And so, when he regularly returns to Benin, to visit his family, he finds in the living room an enlarged photograph of not-so-wayward son with President Barack Obama. Born in 1973, Loueke was at first a percussionist, but began playing guitar in his mid to late teens, at first focusing on “African pop.” He discovered jazz via albums by George Benson and others, relying on audio cassettes that a friend obtained from the French Cultural Centre in the port city of Cotonou. Not realizing, initially, that Benson and other jazz greats like Wes Montgomery, Charlie Christian, and Grant Green were often improvising, Loueke learned pieces from the albums note for note—he played the cassettes with weak batteries, which slowed the tape, to get the notes, and then plugged in the player to learn to mimic the players’ speed and delivery. After playing in hotels for three years, he moved to Ivory Coast in 1990 to study classical music history and theory, but ended up spending part of his education teaching jazz to his tutors. If Loueke readily admits that his approach was shaped early in his jazz schooling by not really knowing what it was he was hearing, that soon changed. He rapidly gathered techniques and stylistic pointers that he threaded into a highly distinctive personal style that starts with the popular rhythms of his native Benin and Afropop and adds much more. While at Berklee, for example, his trio mates in the trio Gilfema, Hungarian drummer Ferenc Nemeth and Italian/Swedish bassist Massimo Biolcati, introduced him to the complex, shifting time signatures of central European folk music. While listening attentively throughout rock and jazz—as his recordings demonstrate—he was stretching himself on the road and in recording studios with a host of leaders eager to have him along. Those have included Wayne Shorter, George Garzone, Jeff “Tain” Watts, Charlie Haden, Vinnie Colaiuta, Roy Hargrove, Kenny Barron, and Jack DeJohnette. Loueke has also recorded with vocalist, and fellow Beninese, Angelique Kidjo, as well as pianist Robert Glasper’s jazz/hip-hop-exploring Experiment. With Nemeth and Biolcati, who accompany him in Seattle, he has developed, during their now 20 years of playing together on and off, a distinctive “global jazz” style, crowd-pleasing both for its energy and its immediacy. That can be heard on their two releases on ObliqSound, Gilfema (2005) and Gilfema + 2 (2008), as well as two releases on Blue Note, Karibu (2008) and Gaia (2015), as well as on 2010’s Mwaliko with a larger caste of collaborators. The Gilfema releases are just a small part of the rapidly swelling discography of Lionel Loueke, but essential ones, in a power-trio setting that offers a front-row view of directions jazz is taking in the hands of a master guitarist with a global view of elements that can freshen it. Tickets are $20 adult, $18 Earshot members and senior citizens, $10 students and military and are avaialble at earshot.org.